Smile! 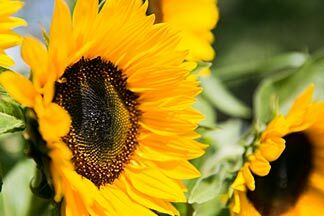 Sunflowers are enormously popular because they always seem to be beaming at you. 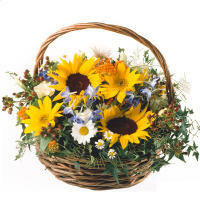 Which is why they are especially good at creating a happy mood, and the seeds are also a great cooking ingredient. Read on to find out how to make eyecatching decorations and tasty culinary treats. Interested? Simply click on our headlines and be inspired! A party must be visible from a long way away. 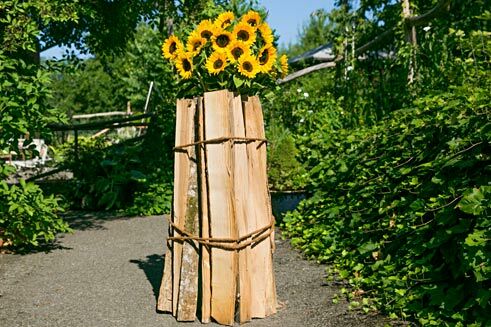 And what could be a better eye-catcher than radiant sunflowers peaking out from behind wooden logs one metre tall? Two people are needed to set up this decoration, but it's done in a flash. 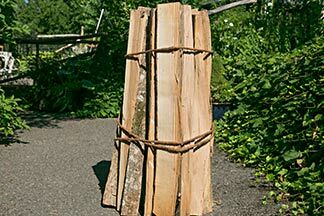 Materials: Wooden logs one metre in length; a water-tight container (e.g. 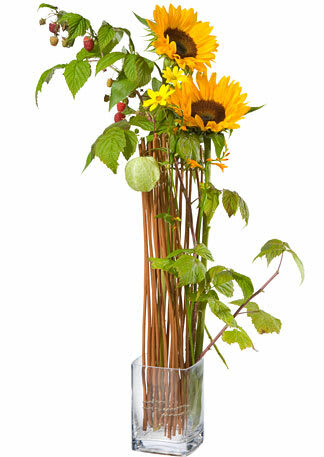 vase, umbrella stand) for internal stability and to put the flowers in; thick natural rope (e.g. 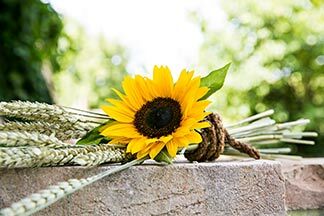 coir rope); sunflowers. 1. Put the container at the place where you want this welcome greeting and fill it with water. 2. Surround the container with the logs. 3. 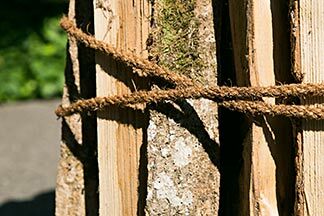 While one person holds the wood together, the other ties it with the rope: wind the rope two or three times around the logs at the top and bottom and then tie a knot. 4. Now insert the sunflowers - all done! Tips: You can also refresh this decoration later on with different fresh flowers or decorate it with plants. 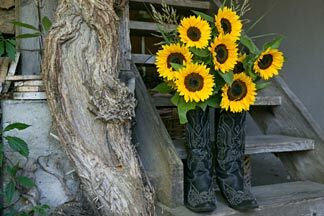 You can also use the tied logs as a "stage" for the boot filled with sunflowers (see decorative tip below). 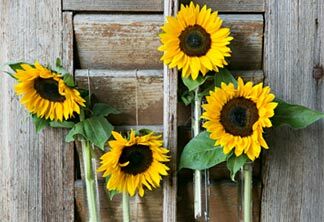 Sunflowers are beautiful even without a garden party. The shop is HERE. Do you have old window shutters that you've always meant to take for recycling? Be glad that you never did. Because we might have an idea for a charming way to use them. 1. 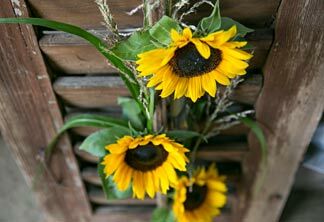 Attach the test tubes to the shutters with string or wire, fill them with water and insert the sunflowers. 2. Place the shutters where you would like to draw your guests' attention to the party. Tips: This decoration is also effective as the background to a buffet table. Because of the flowers, take care not to place it too close to a source of heat (e.g. a barbecue). 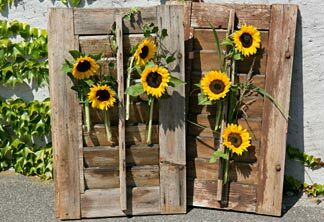 Instead of the shutters, you can also decorate a wooden ladder with flowers and lean it against a tree or a wall. 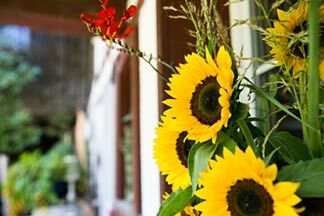 You've got the shutters, but not the sunflowers? The shop is HERE. 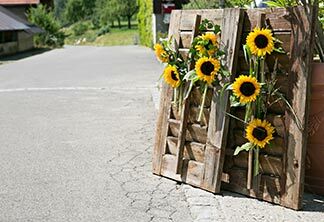 Sunny flowers instead of signs to guide guests to your party? 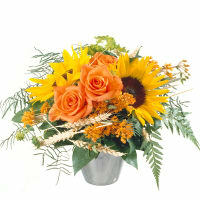 This cheerful eye-catcher is bound to be noticed and will enliven the mood right from the start. 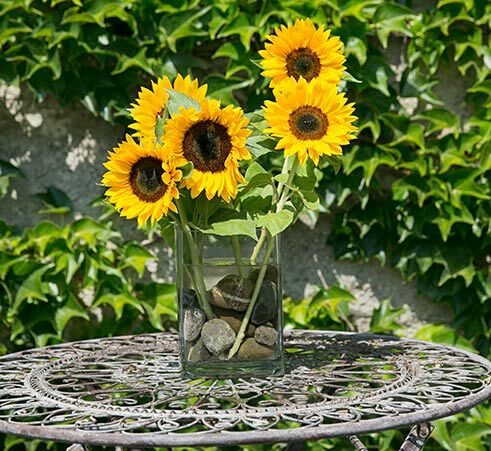 Materials: Candle holder or plant stand; lattice made of rabbit wire; 1.2 mm thick wire; straw; test tube; sunflowers. 1. Cut a piece of rabbit wire. 2. Shape a loose ball out of straw and place it on the rabbit wire. 3. Surround the straw with the rabbit wire by forming the wire into a kind of ball. 4. Pull the straw out between the mesh of the wire so that the wire is as well concealed as possible. 5. Place this wire and straw structure on the stand and secure it with wire if required. 6. 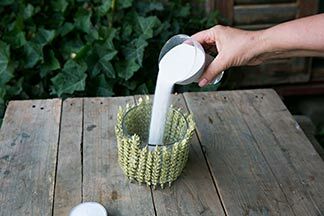 Place 2-3 test tubes in the straw, fill them with water and insert the sunflowers. 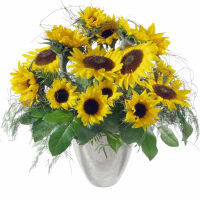 Tips: A rabbit-wire lattice with straw and sunflowers also looks good in a nice bowl. It has to be weighed down with a few stones so that the wind doesn't carry it away. 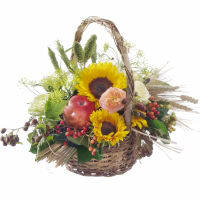 Another variation is to hang up this combination of sunflowers and straw ball. Invited to a party? 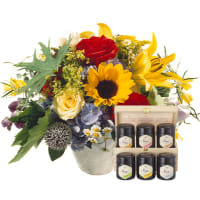 You'll find our tips on gifts HERE. 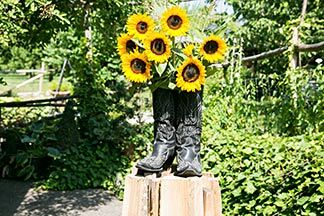 Try to put your guests in the party mood right from the very start: for example, with sunflowers that – depending on your theme – are arranged in boots (gardening boots, cowboy boots) or shoes (e.g. old army shoes). 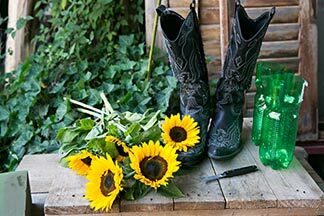 Materials: One or more pairs of gardening boots; a water-tight container that fits into the boots (e.g. 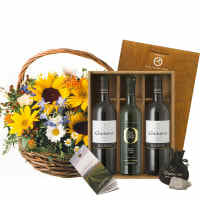 a PET bottle with the top cut off); water and floral preservative; sunflowers; possibly a different-coloured flower; grass stems; long ivy tendril; raffia. 1. 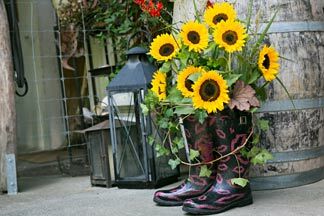 Add water and floral preservative to the water-tight container and insert the container into the boot. 2. 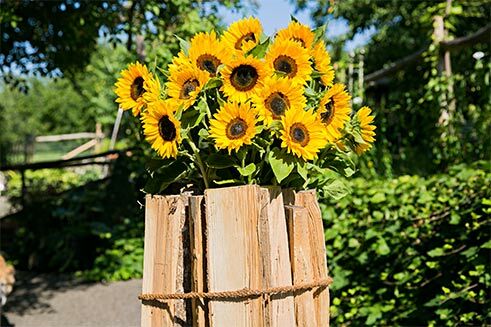 Place the sunflowers in the water together with a different-coloured flower or some grass stems to create accents if you wish. Tips: When you change the water, remove the container from the boot. 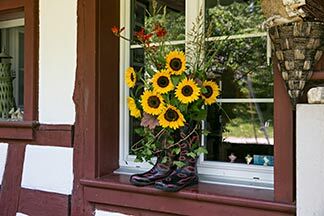 This decoration isn't only effective at the entrance, but also in window recesses, on garden walls or on tied wooden logs (see previously described decorative tip). 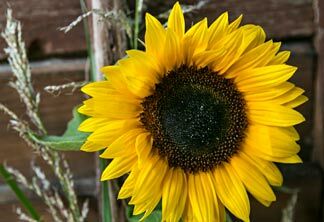 You'll find our care tips for sunflowers HERE. Storm lanterns don't just look good at night, but also as the twilight descends. Would you like to see a variant that's a particularly good match with summer: it's quick to make and extremely effective. Materials: Glasses with a smooth surface; stems of wheat; hot glue; bird litter and tea candles (or floating candles and water). 1. 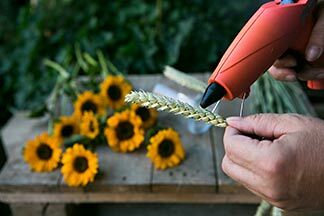 Cut the ears of the wheat stems to the height of the glasses. 2. Glue the ears to the glasses with hot glue. Variant 1: Add a little bird litter to the glasses and place one tea candle per glass on top. Variant 2: Add a little water and the floating candles to the glasses. Tip: Storm lanterns are not just effective individually, but in rows of at least 3. Would you rather order them than make your own? The shop is HERE. 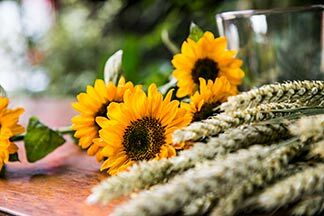 Cereals and sunflowers are the essence of summer! We'll show you an effective decorative variant that your guests will love. 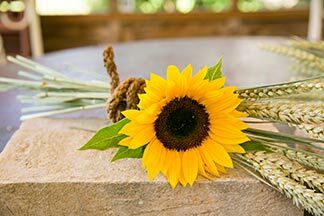 Materials: Stems of cereals (we used stems of wheat, but oats, rye and barley are also suitable); raffia; test tube with lid; sunflower; natural string. 1. Take one stem in your left hand (for left-handers: your right hand) and hold it firmly with your thumb. 2. Add the other stems one by one, placing them at a slight angle to create a spiral. Please note: all the stems have to point in the same direction so that the spiral looks really pretty and doesn't end up looking like a game of jack-straws. 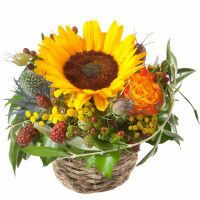 Keep turning the resulting bouquet slightly from time to time so that it takes on a nice, round shape. 3. Now wind raffia firmly round the bouquet one third of the way from the top, bind the raffia so tight that everything holds together well, and cover the binding by winding a piece of natural string around it. If you've done it right, the stems below the binding will make up two thirds of the whole. 4. Finally, cut all stems to the same length with a sharp scissors. 5. 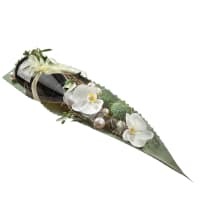 Now fill the test tube, place the lid on and push the tube carefully into the centre of the bouquet. 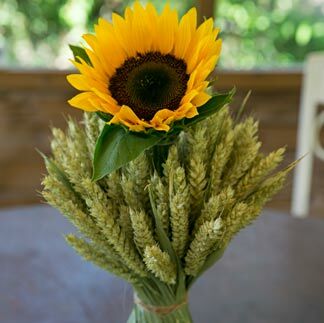 Insert the sunflower so that only the head peeps out of the wheat bouquet. 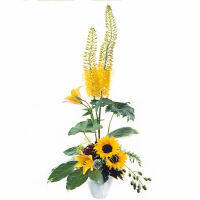 Tips: This decoration is suitable for the sideboard or as a table decoration when placed in a row. However, it is also effective as an individual piece (e.g. in a niche) or combined with the wheat-ear storm lantern described above. The effect is even greater if you cleverly combine individual decorative elements and make a stage for them. In our case, the "stage" consists of old bricks. 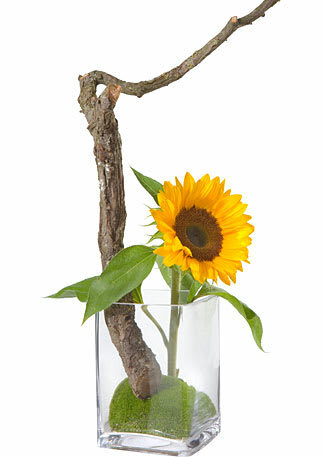 Materials: Stems of cereals; raffia; natural string; test tube with plastic lid; sunflower; brick. 1. Fill the test tube with water and close it with the plastic lid. 2. Now take one stem in your left hand (left-handers: right hand) and hold it firmly with your thumb. 3. Then add the other stems one by one, placing them at a slight angle to create a spiral. Please note: all the stems have to point in the same direction so that the spiral looks really pretty and doesn't end up looking like a game of jack-straws. 4. 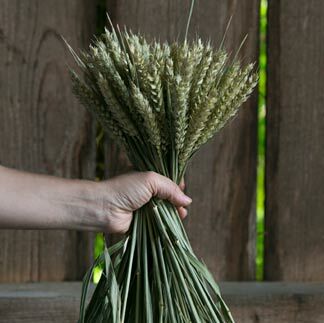 As soon as the sheaf has reached the desired size, push the test tube filled with water carefully into the sheaf in such a way that it is concealed by the stems. 5. 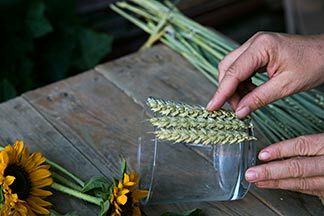 Wind raffia round the sheaf, bind it so tightly that everything holds together well, and cover it by winding a piece of natural string around it. 6. 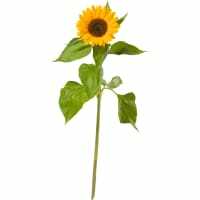 Now place the sunflower in the test tube - very carefully. 7. Finally, set the stage for the sheaf, e.g. on an old brick. 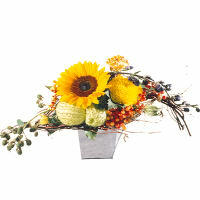 Tips: This decoration is suitable as an individual piece or a sequence, on tables and ledges. 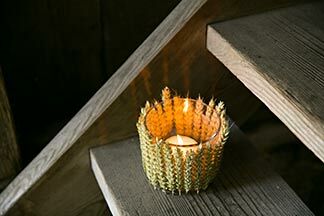 You can also combine the sheaves with the wheat-ear storm lanterns described above in an Stylish features with flowers are also to be found HERE. Sometimes, even simple decorations are amazingly effective. 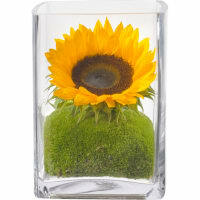 For example, a glass vase filled with sunflowers. 1. 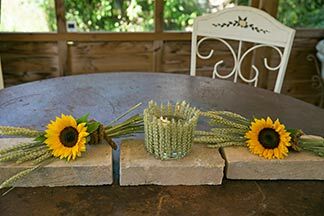 Place stones in the vase and fill it with water. The stones not only look good, they also give the vase the stability it needs. 2. Arrange the flowers in it. In this specific case, don't be too fussy. It looks more natural if the flowers aren't all exactly the same length. 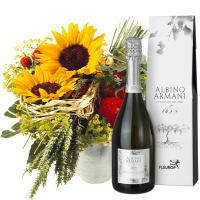 Tips: The glass vases offered by Fleurop are perfect for this decoration. 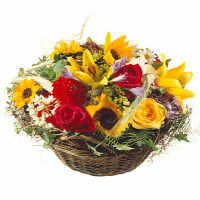 You can buy them at any Fleurop florist or order them – together with a bouquet – from www.fleurop.ch. You'd like to order flowers with a vase? You'll find our suggestions HERE. 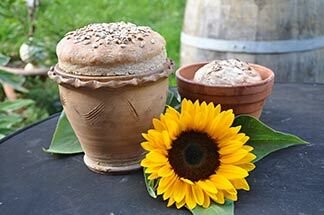 This bread not only tastes great, is also unusual and perfect for a garden party (including as a take-along gift). 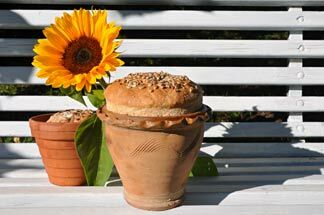 What you need: Simple terracotta flowerpots, various sizes; oil; baking paper; 500 g whole wheat flour (sieved); 100 g sunflower seeds; 1 tsp salt; 1 sachet dried yeast; approx. 3.5 dl lukewarm water; 1 tbsp sunflower oil. 1. 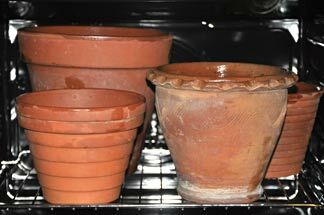 Wash and rinse the terracotta pots well before use and let them dry. Brush the inside with oil and place in a heated oven (250°C) for 30 minutes. Remove the pots and let them cool. 2. Line the base and if necessary the sides with baking paper and brush generously with oil. 3. And now for the bread dough. Mix the flour and dry yeast in a bowl and make a depression in the middle of the flour. 4. Now add the oil, salt and – slowly – the water. Knead the dough until no longer sticky and add the sunflower seeds. 5. Cover the bowl with a damp cloth, place in a warm place and let the dough rise to twice its size. 6. Then briefly knead the dough again and place in the prepared flower pots. The pots should be filled to 2/3 capacity. 7. Cover the pots and let the dough rise again for about 30 minutes, until it is just below the top of the pot. Brush the dough with water, sieve a bit of flour onto the dough, decorate with sunflower seeds and bake in a preheated oven at 220°C for 30 to 40 minutes, depending on size. 8. Run a knife around the inside of the pots, remove the sunflower bread and let it cool. Put the bread back in the flowerpots to serve. Tips: When the loaves have been removed from the pots, simply clean the pots with a dry cloth. No need to wash them out. 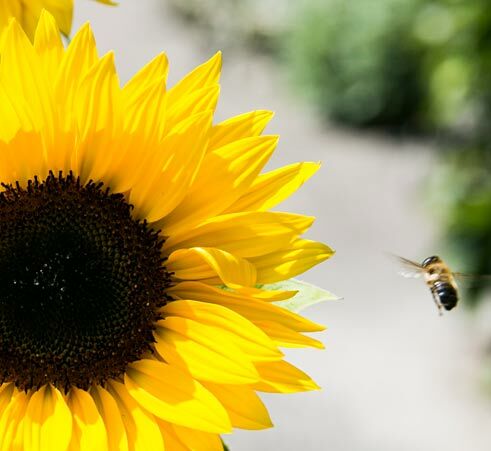 What you need: 1 large and 1 small glass vase (or 1 large glass vase and 1 drinking glass); flotsam (shells, stones, sand, driftwood, etc., as found on the beach or riverbank); sunflowers, reeds and/or grasses. A tea light is a really nice extra feature. 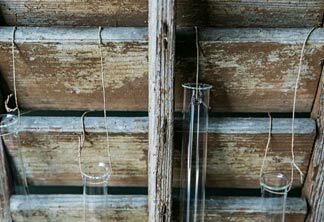 How to make it: Stellen Sie eine kleinere Glasvase (oder ein Trinkglas) in eine grössere Glasvase und füllen Sie den Zwischenraum mit Strandgut. 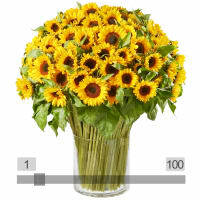 Geben Sie Wasser in den kleineren Behälter und benützen Sie ihn als Vase für Blumen, Schilf oder Gräser. 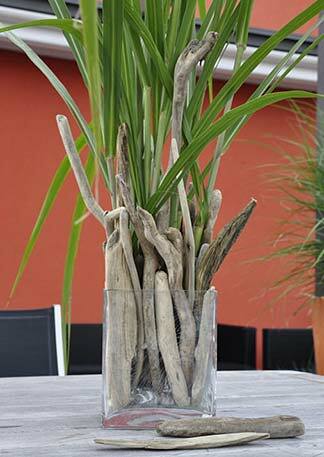 Tipps: Place a small glass vase in the large glass vase and fill the space between the vases with flotsam. 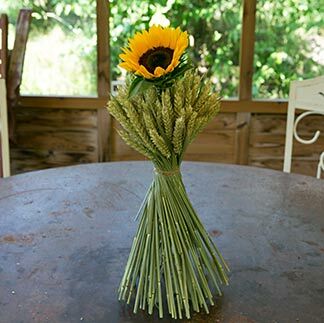 Fill the smaller vase with water and arrange the flowers, reeds and grasses in it. 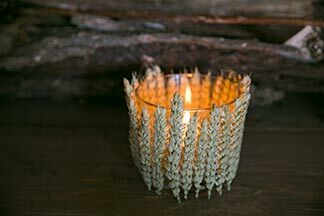 Tip: You could also place a tea light in the smaller glass vase. You can create a particularly elegant eyecatcher by placing three glass vases of equal size next to each other and filling them, either all three with more or less similar flotsam, or one with flotsam and a tea light and the others with flotsam and flowers. Regarding the glass vases, the ones on offer at Fleurop are perfect for this purpose – they are available from any Fleurop flower shop or – together with a bouquet – at www.fleurop.ch. Look HERE for more good-vibe ideas!